There are two rows of small bones that comprise the wrist. The scaphoid is one of these bones, which lies at the side of the thumb and spans both rows. Its position in relation to the other bones in the wrist make it susceptible to fracture. It is in fact the most commonly fractured bone in the wrist. 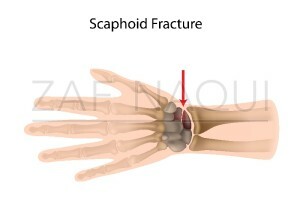 Scaphoid fractures usually occur after a fall onto the outstretched hand. People of all ages can sustain a scaphoid fracture but is more frequent in men between the age of 20 and 30 years. It usually occurs following a fall onto the outstretched hand and not uncommonly during sports activities e.g. 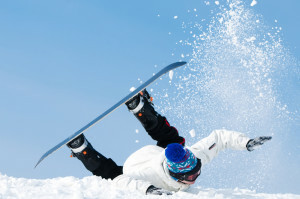 snowboarding or in motor vehicle accidents. Symptoms include pain and swelling around the base of the thumb. These symptoms may be severe at first but quickly improve and therefore the injury is commonly interpreted as a sprain rather than a fracture. Usually patients first attend accident and emergency where the emergency doctor performs an examination. The doctor may apply pressure to the base of the thumb in a region known as the anatomical snuffbox to detect any tenderness of the scaphoid bone, which is a sign of a fracture. X-rays of the wrist are also routinely performed. Sometimes the x-rays do not detect the fracture when it is early and patients are treated cautiously with a splint and repeat x-ray at 10-14 days after the initial injury. An MRI scan can sometimes be performed and can detect fractures at an earlier stage than x-rays (see FAQs page). Treatment depends upon whether the fracture is displaced (whether the two fragments of the scaphoid bone have lost their normal alignment) or not displaced and where precisely in the scaphoid the fracture is located. Non-displaced fractures can be treated by application of a plaster cast over the wrist for between 6 to 12 weeks but sometimes surgery can be performed to insert a metal screw into the bones to facilitate quicker healing. Displaced fractures require surgery to insert a metal screw to bring the bones back into normal alignment. The precise location of the fracture within the scaphoid bone will also influence the decision as to whether surgery is required, since fractures closer to the wrist are less likely to heal without surgery. Surgical treatment involves an incision over the wrist and the insertion of a metal screw into the two fragments of the scaphoid bone to hold them in a normal alignment whilst healing takes place. In some patients a bone graft is used to stimulate the healing process particularly where the bone is broken into multiple fragments. The bone graft may be taken from the wrist, elbow or hip. Mr. Naqui performs scaphoid fracture surgery at a number of hospitals around Manchester (See Hospitals page). The surgery usually lasts 45 to 90 minutes depending upon the nature of the procedure and is a day case procedure requiring regional or general anaesthetic. The type and size of scar depends upon the location of the fracture and whether an open or percutaneous (minimally invasive) approach is used. Delicate stitches will be needed to close the wound. A dressing and cast will be placed over the wound, which will be removed at 4 to 6 weeks. The stitches are will be removed at 10-14 days after the operation either at your GP or at the Hand clinic. You will be seen by Mr. Naqui 2 weeks after the surgery and x-rays will be repeated to monitor the healing process. Mr. Naqui and the hand therapist will provide you with specific exercises to perform after surgery to regain normal wrist movements. A splint is usually worn for 4-6 weeks after surgery. The fractured scaphoid may not heal, this is known as non-union, and is influenced by the precise location of the fracture along the length of the scaphoid, the delay between injury and surgery, and individual factors such as other diseases the patient suffers with. It is possible that the bone may die, this is known as avascular necrosis, and is again dependent on the precise location of the fracture, the delay to surgery and individual factors. Arthritis may occur in patients that develop non-union or avascular necrosis and this may cause pain and stiffness of the wrist in the long term. Further surgery may be performed to help prevent arthritis in patients with non-union or avascular necrosis. The risks of post-operative infection and nerve injury are small.